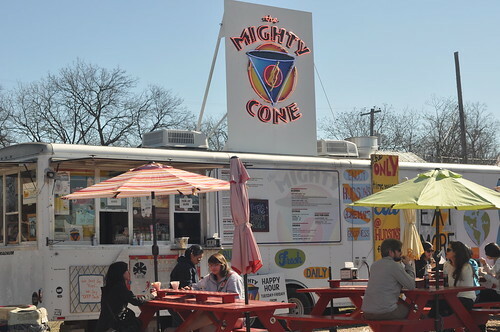 When I first saw The Mighty Cone listed as a must-visit food truck in Austin I was convinced that it was an ice cream truck. It’s an easy mistake to make…you hear cone, you know it’s a truck, it’s a fairly logical leap that they’d serve ice cream. 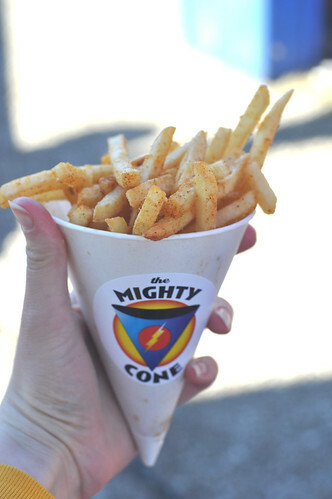 I’m here to tell you that while you can’t get ice cream from the Mighty Cone you can get mighty, mighty good fries…. 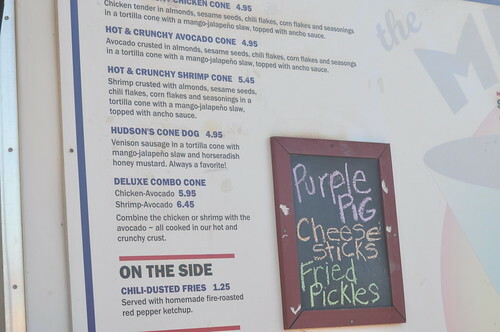 The bulk of the menu ink at the Cone is spent on their other savories like fried chicken, avocado and shrimp coated in their crunchy almond, sesame seed, cornflake and chili crust then served in a tortilla cone. But it was the chili-dusted fries with homemade roasted red pepper ketchup that captured my fancy. At $1.25 for a cone it was some of the best money I spent in Austin. The fries were nice and crispy on the outside with a lovely dusting of chili powder, best of all (at least from my perspective) they were perfectly salted. 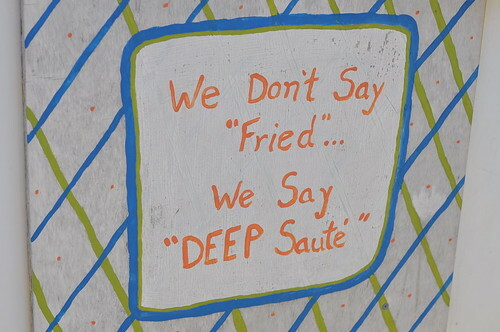 I like to hit my fries with a little sodium-lovin’ but often times only the ones on top get any of the salt. 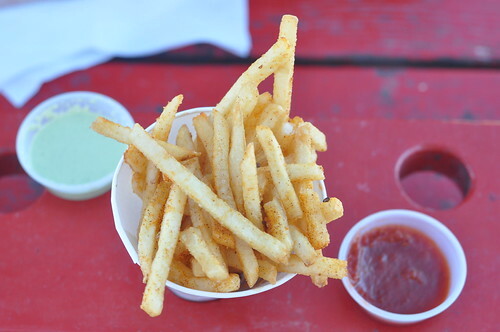 Mmmm…crispy, spicy, salty fries. In addition to their homemade ketchup I also tried their jalapeño ranch dipping sauce—I’m not a ranch dressing kind of gal, I didn’t grow up eating it and frankly, it tastes a bit gross to me, but the addition of jalapeño gave it just the right amount of kick to mask any serious ranchyness. Thumbs up as well to their garlic aioli which looked and tasted like it had maybe a touch of mustard. The cones aren’t huge. I shared mine with my lovely hostess, but they don’t need to be huge, in fact I’m all for smaller more manageable servings (that are co-measurately less expensive, don’t give me a tiny portion and still charge me $5!). With the smaller serving I had the chance to try other nearby trucks (more on them soon!) and in my book, more food truck variety is a big win! When I visited they were on S. Congress Avenue, but as of this week they’ve move to Rio Rancho Eatery on 26th and Rio Grande! Congrats on the move guys! Looking forward to visiting you on my next trip to Texas. Headed to Austin next month and excited to try this!